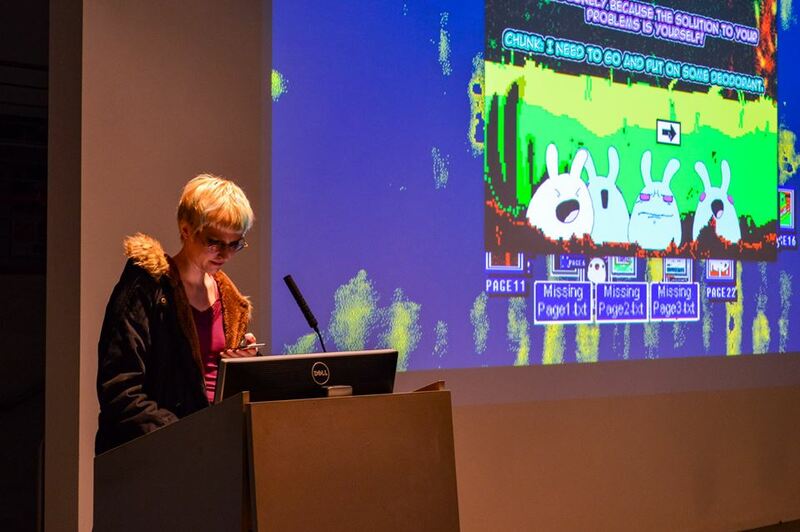 I am publishing the written transcript of the lecture I gave at the UCLA Game Lab. The Game Lab is a wonderful place full of very talented people. It was lovely to visit it and share what I knew about things. Here is the transcript. The meat of the talk (the good part imo) is after I play the game, so you can skip those design notes for showing it. …Skipping the introduction about me, and jumping right in. – picture via the event’s facebook post. 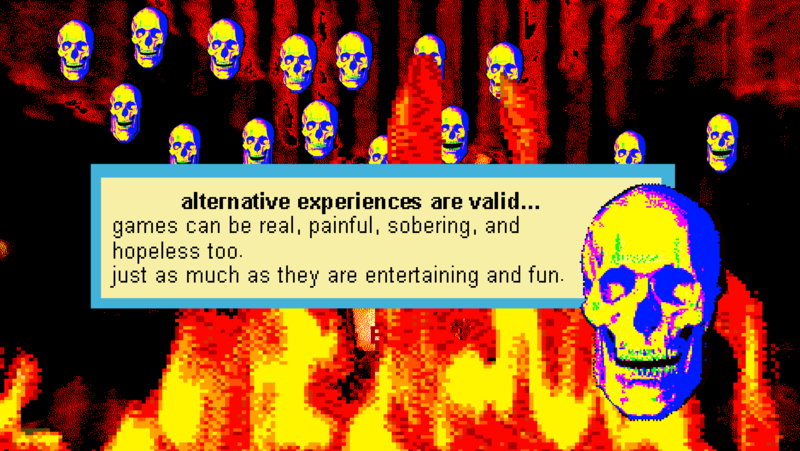 A lot of what I create falls under the label of “altgame” or “artgame” and if you’re not familiar with it, these are some wonderful sites that curate this sort of work. there’s lots of inspiration there. My latest large project is called “Everything is going to be OK“. 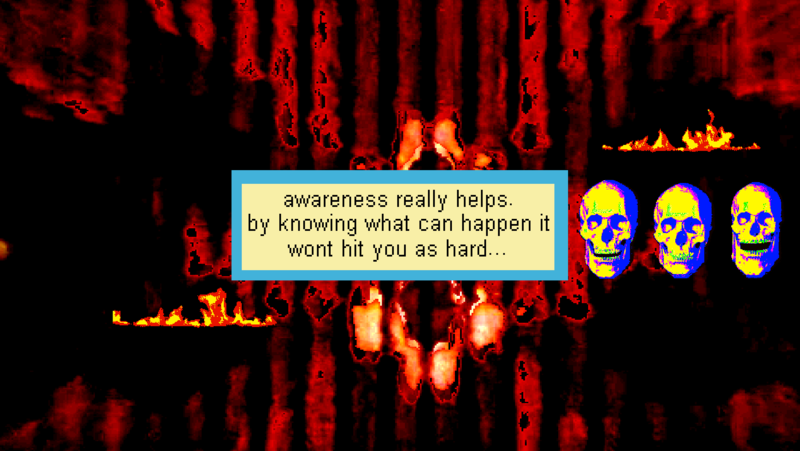 It’s an interactive zine that’s somewhat reminiscent to early freeware, meets haunted educational software, meets a collection of comedic vignettes. It’s a very personal work about trauma, struggle, and the emotional repercussions of surviving difficult things. When I say that it’s a “personal work”, with that I mean I talk about actual things that happened to me, openly share how that was like, and how that was overcome. It’s meant to empower and be honest. There are plenty of personal life stories in this. So I’ll be showing you a bit of it first since this is the topic of the talk. ** YOU CAN SKIP THIS PART. The meat of the talk is after the playthrough. * Each icon is a different vignette. Everything is voice acted, and it’s kind of like a cartoon. * Context of each page is meant to be metaphoric. Meaning is open to interpretation. * Nothing repeats. All are very different. Rule’s don’t often repeat in terms of how you “play”. * Interaction is cryptic. The player has to figure out how to play by paying attention. That attentiveness you expect of a player to “figure things out” works well in personal work because you are asking them to “be a good listener”. They form a friendship with the game, and messages, through that effort. * Some pages will play out, and finish, without player participation. Interaction just gives an optimal outcome. It can be meaningful to invalidate the purpose of the player, or their participation. * There are many hidden icons, and interactions, buried in the backgrounds of various scenes. These trigger different events, or open new windows with new things in them. As you play you end up with this accumulation of open windows, each doing their own thing. There are lots of tangents, hidden easter eggs, and rabbit holes, to discover if you really interact with everything. The game rewards you for exploring. * You can play it “superficially” by just following what’s immediately in front of you, but if you interact in less obvious ways you find stuff. There’s lots of poetry and personal writing hidden throughout the game this way. * Many pages are a criticism of online culture, and how that alienates us. * The structure is like that of an interactive cartoon. A scene plays out, waits for interaction, then continues to play. When you have something that’s very involving, especially for how different it is, and requires a lot of attention, it’s good to pace that out and give players breaks where they don’t have to do much. This keeps their attention, and keeps things new and interesting, without being very overbearing. 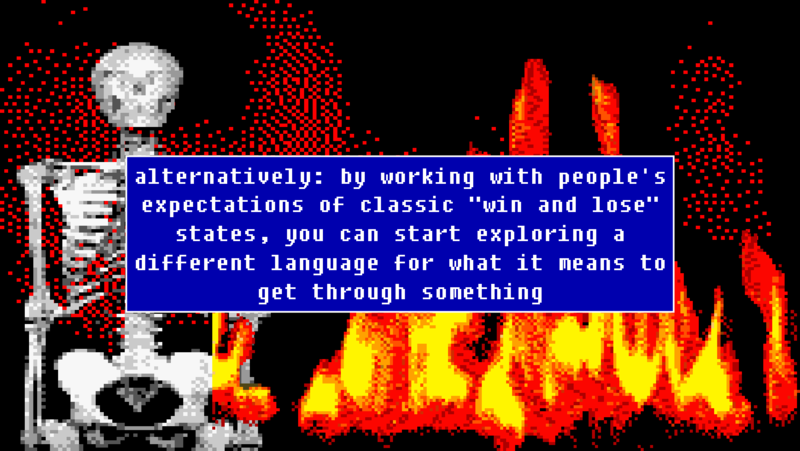 ** When you’re doing work that’s VERY different, you are basically inventing a new language for how to interact with something, and teaching that to the player. Even for work like this, that looks chaotic, or unstructured, there are plenty of patterns for how it asks someone to interact. This keeps people’s attention without overwhelming, or frustrating, them too much. ** The fact that a lot of this is comedy, with cute cartoon characters, makes it disarming, so they are more open to interacting with it in unusual ways. ** Pacing for what you bombard a player with is important. If it’s too much then you’re being too noisy, and risk coming off as pointless, so it’s good to give them breaks. * The “win” state is often determined at random. Success is open to interpretation. * This game is also an art tool. This ranges from taking selfies, drawing, writing, to fairy tale generating. ** Using this as an art tool is important because the game “grows” as you play it, and saves itself out to your drive. It leaves pieces of itself behind, and that breaks a sort of wall in terms of it entering the “real world”. ** People often find what they created in it, and remember playing it. ** The fact that people participate creatively makes this a lot more personal, because art is very personal. Playing inside of something that’s already a very personal game, requiring lots of introspection, and then it asks you to make things in it, makes the overall experience much more emotional. It can be therapeutic. * A lot of old-school or historic UI’s are used throughout the game. Throwbacks to historic GUI’s create a sense of familiarity and approachability. It’s a comfort zone in terms of interacting and playing with usability expectations. ** Computers are a place where your personal history loves. You can allude to that space, by placing the game in these contexts, and it feels more intimate that way. * In many of these the UI is very cryptic, and you have to figure out how it works for yourself. It’s like presenting the player with an alien device. Curiosity is a wonderful thing to invite, especially if you mix that with “game meets UI” work. * There is a LOT of procedurally generated work in this. Procedural generation ranges from writing, to art, to things you can save out. ** For example; procedurally generated motivational posters. You are often given random weird life advice. This is impactful, for stuff that’s about life, because I think that life is generally pretty meaningless, and people are REALLY good at reading meaning into things. So it’s interesting to see this done with stuff like life advice, or making sense of what’s going on. * In many pages, when you have reached a certain number of interactions, the page will just close on you. Things randomly quitting on the player, whenever the game is “done” with them, instead of the player determining if they are done, kind of reverses roles. You’re not sure if you’re playing the game, or if the game is playing you. Something automatically closing on you also king of leaves you with a feeling of emptiness (it feels like it “crashed”), so this is a good emotional range to explore. * In many of the pages the only condition there is is to “lose”. You can’t really win, but you are rewarded for how long you survive. This is impactful because if you move away from our traditional idea of a game punishing you for losing, where the inevitable outcome should be to win… what other mindsets can we cultivate? – How would a game be if we move away from our traditional reward structures? – Can you teach people to be OK with losing, and seeing the value in that? – Can people be OK with failure, and even enjoy it? *** This is a thought that I often have when designing these things, because I think there are more states in life that to “win” or “lose”, and if you break away from game traditions, you end up exploring some very impactful themes. It can communicate a lot of emotion, or encourage people to think. This works because people expect certain things from games, and if you step outside of that (even just a little), it’s a lot more of a memorable experience for how it did things different. * There is a lot of poetry hidden throughout. * This is personal writing that’s much more “on point” about the topics here. * I hid personal writing, because it’s structured in a way that you can experience the game superficially, and it’s just “dark comedy” or you can put some effort into getting to know it by digging in and then you start to get a better idea about the messages and themes. 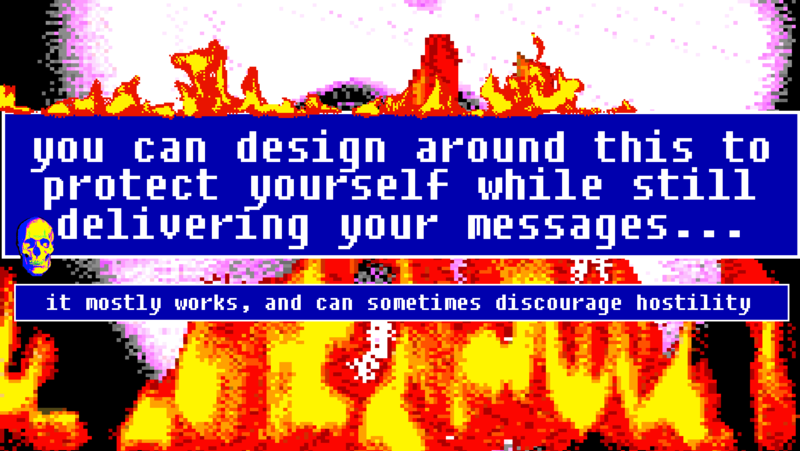 * Obscuring messages inside a game is interesting because it feels a lot like getting to know a person. The more time you sped with it, and dig in, the more of a relationship you form with it because you get to know what it’s really about. It feels special. ** That’s about it. There’s a lot to it. You can (I’m told) spend up to three hours in it. The framing in “Everything is going to be OK” is that of using comedy to communicate these topics. On the surface it comes off as a dark comedy cartoon type thing, and it’s a bit of a satire on how life can be. None of these topics are “fun”, or really something you’d expect a game to be made about. There are a lot of expectations in games that games have to meet certain prerequisites for being entertaining, or “fun”, and I think it’s mindsets like this that often hold the medium back from being a fully self realized art-form. I understand how that sounds, but art doesn’t always have to be “fun”. Art is a lot of things in the realm of human expression. Some art is just not going to be entertaining. It can be painful, real, sober, honest, cutting, hopeless just as much as it can be beautiful, uplifting, healing, and freeing. Coming into this, with an understanding that games are inclusive, and mature enough, to be all these things, then something like “Everything is going to be OK” is an obvious, even a good thing to make. I made this because saying what it says is important to me. As an artist I believe that if life puts you through terrible things, you can make art out of it that will empower others going through the same. It’s part of building the human narrative. You leave something behind that will help others. So “Everything is going to be OK” is a collection of life experiences, and something of a commentary on power. It’s about what we view as powerful, and why we don’t see survivors as powerful. Games are known for their narratives of overcoming problems by brute force, and celebrating the clear “winner” that conquered any opposition. Here it’s very difficult to present power as something else especially in terms of struggle and survival. I think that the way we view power is largely a byproduct of a historically patriarchal system. 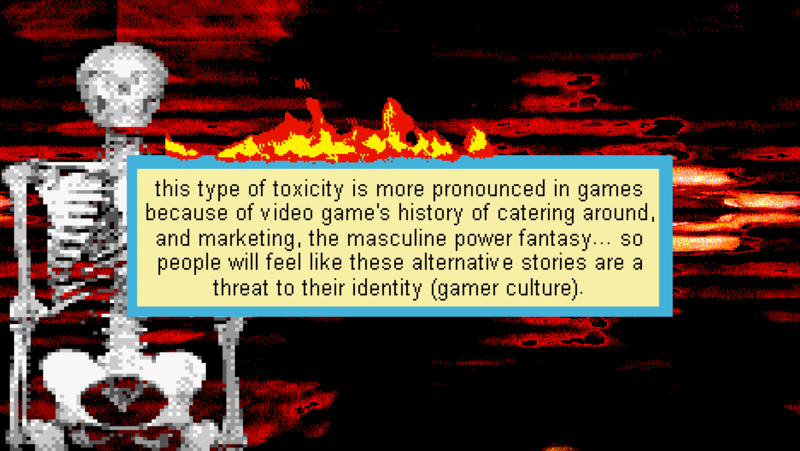 Popular entertainment, such as games, very much reinforces that. Are people that live with trauma strong? How is it like from a survivor’s standpoint? Why do we view suicide as weak, or selfish, when the person that lived with it got as far as they did? We don’t exactly have a space for validating people that struggle with these things even when, to many of us, just being here at the end of the day is a “victory”… but in context of our culture that’s not powerful. If we’re not allowed to view ourselves, and others that struggle with these things, as powerful how do we overcome? In many ways, culturally, we teach people to be perpetual survivors but don’t allow for a space to move past pain and heal. A lot of this is for how we view “strength”. I think that this is a very impactful space to explore in games because you can work with people’s expectations of winning. I don’t think that strength is in how many people you can hurt, conquer, or walk over, but for how whole you can be despite abuse. For your own tenacity, persistence, and ability to exist despite what life puts you through. How long you can live with what happened. How strong you are for just being here. When you put people into these types of scenarios, or explore these topics in a game, it can be a very introspective experience. It can help them grow, and understand others that deal with these things. Most people are genuinely grateful for such experiences after playing it. So these are the mentalities that I brought into this work. As you can tell it’s not exactly something people expect from a game. “Everything is going to be OK” puts you into a number of scenarios, that all play out, either humorously or more “on point” about these topics, and asks for a lot of introspection. It doesn’t really let you “win” because I don’t think that happens in real life. 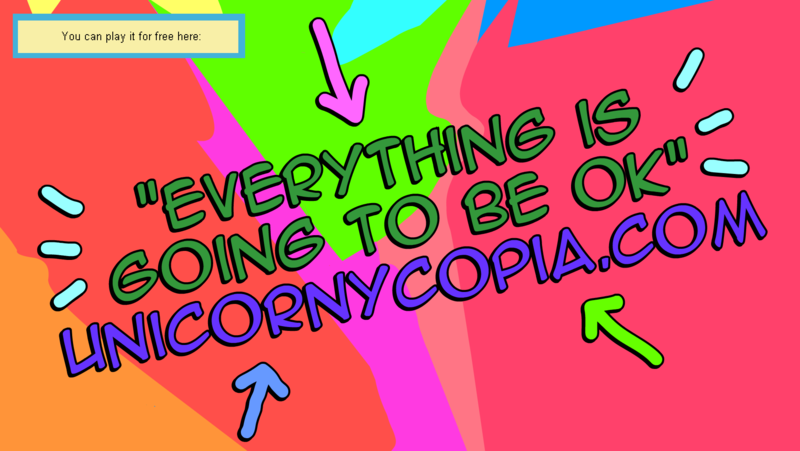 It asks you to be OK despite everything, and even laugh at how bad things can get. People that play it, that struggle with these issues, usually feel understood by it. People that play it without knowing how that’s like, usually have a better understanding afterwards. Interesting experience was when I was showcasing it and a guy came up to me and told me that it helped him understand some of his friends, and he felt really bad about how much of a jerk he was, and told me that he had to apologize to some people. Overall, there’s something really important to explore here. I think communicating all this in an interactive format is much more powerful, because people are asked to participate rather than passively watch. The interactive element makes personal stories a lot more personal. So this worked. “Everything is going to be OK” enjoyed quite a bit of critical acclaim, and a lot of people have said that it helped them, spoke to them, helped them heal, and helped talk them off the ledge. It is hard not to talk about this project without also discussing the more difficult aspects of how It has been treated, and the climate of game culture that something like this is in. I don’t think that the commercial culture that we currently have in games is very conductive to topics like this. Your usual gamer expects to be entertained. They don’t expect, or want, very transcending life experiences unless it’s the “safe” kind. They expect to win at the end, and have good feelings about how powerful, skilled, or successful they are after playing it. If you examine games, as a whole, the bar of emotional intelligence is pretty low for what people will critically acclaim as the next game of the year, or Citizen Kane of video games. I really don’t think something like God of War deserves the championing it gets for being a deeply moving experience, especially not when examining the misogynistic context and history it has, as compared to a queer game, or games made by people of color about their experiences, games about women’s experiences and struggles… ones that really take on honest deeply moving life topics. Our preferences, and what we are willing to acclaim, still very much leans in the commercial direction of preferring mainstream narratives like those about powerful white men. This isn’t very conductive to safely discussing other messages, made by other people, who make games not geared toward the standard white guy gamer. Personal work like this, that talks about these things, has also consistently drawn in a lot of hostility for me. We really need to start having discussions of this type of abuse. Toxic gamer culture is a big problem, and it is especially so for work like this that is made by women, or other marginalized groups, who’s existence this culture has a problem with. In many ways we taught them to hate us, now we have to teach them to tolerate us. I say this because it’s really hard to look past the male archetypes that video games are known for championing and not see an abusive alpha-male figure that enjoys unrequited love and justification for basically beating everyone around him into submission. It hasn’t been a healthy standard to set for what “strength” and “power” are. Traditional masculinity is very alienating. People that don’t fit this mold, and share other types of stories, will get attacked by toxic fanbases. It’s such a common problem by now. We all agree on the fact that games are art. It’s almost an old and tired thing to say, but it’s really important to recognize that not everyone’s art is welcome here, or is given a safe space here. Not the same way as art, or stories, made by men. Something like “Everything is going to be OK” is a work that is very personal. I realize that putting something like this out there, as a published work, will always invite criticism, or harshness, but this is not comparable to how much this happens in games. It is really difficult to have open discussions about things like depression or suicide without the judgement or assumptions that come with it. I think it’s important to examine how this works. If someone like me makes a game discussing the repercussions of sexual assault, or struggle, then that automatically pitches the author as “weak” and someone to eliminate from the heard, in context of the toxic culture here. It’s already clear for how we culturally treat people that struggle with these things, but it’s even more pronounced in games. Fallout for making this has been really hard for a lot of reasons. If it wasn’t internet hate, then it was gross emails, and then it was people that use this as an invitation to get creepy, or make assumptions about the author. This is not easy to navigate, and I think it’s really important to make the point that we HAVE to be careful when encouraging people to make such personal work. 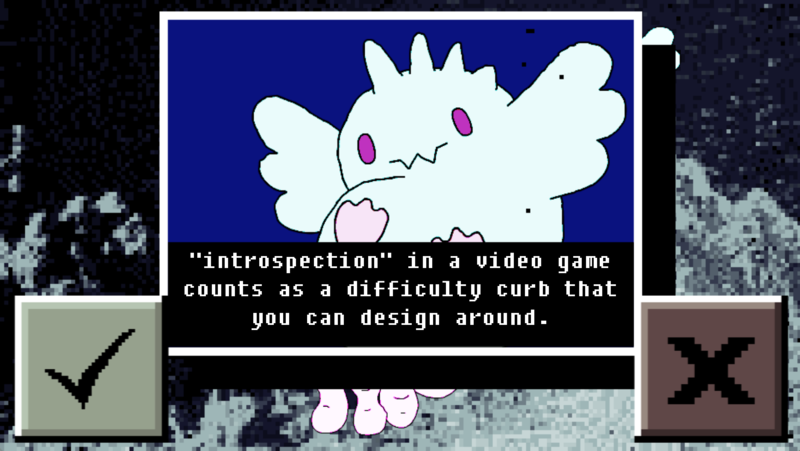 I see students coming in, thinking that making games about sensitive topics, or bearing their heart and soul in the form of personal experiences, is a great idea… but nobody is warning them about what might happen if it rubs Gamers the wrong way. People can get hurt if they are not prepared. I think it’s easier to share these types of messages in other formats. We’re not going to be this likely to extend that treatment to musicians, for example. There is plenty of “sad” depressing or heartfelt music. There are not enough sad depressing or heartfelt games, to normalize these messages. Games are a difficult space to have these discussions in. 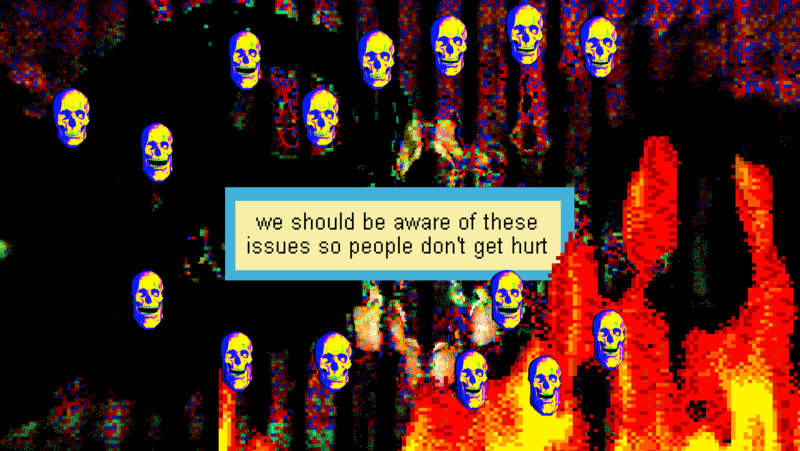 When we encourage people to approach games as a “safe” form of creative expression, in which you can talk about difficult topics, we also need to encourage awareness of the culture that this is still in. The emotional burnout from dealing with harassment that was drawn in because of making something like this can be hard. For anyone that is not a straight up white guy, and is basically on the margins, the risks of making something like this can be harmful. I think it’s important to admit the cultural shortcoming surrounding games that aren’t made by or for the general male audience (men are “safe” in games) we can save a lot of people from getting hurt when they talk about these experiences in their work. but at the end of the day if gamers don’t like the fact that you exist here, or are saying what you are saying, there isn’t much that you can do. We really need to start questioning what we are promoting. What are we normalizing in games? Does how we cater to gamers, and how we validate that particular “boys club” culture, encourage the alienation of others? 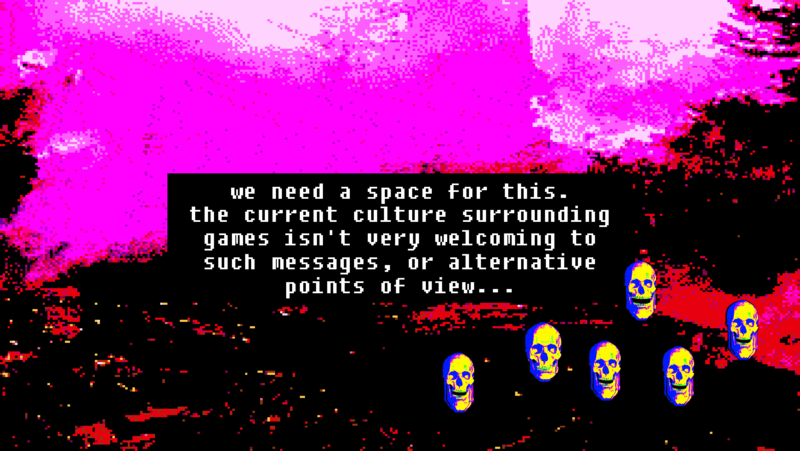 We want games to be art, but they really need to grow up first, otherwise this will always be a medium meant only for men, were messages from everyone else are just passively welcome. 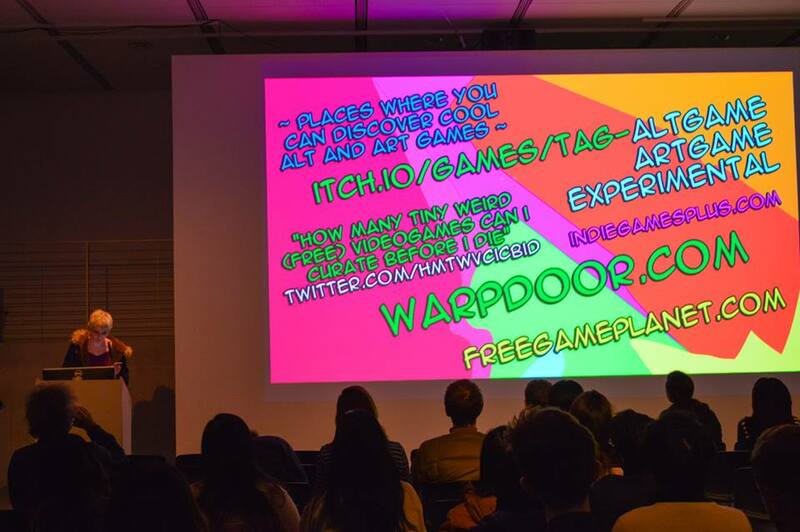 It’s counterproductive to games growing or being taken serious. So, we really should prepare people who might make something different and are on the margins. Things that can happen are stalking (because people feel like the fact that you are sharing personal things is an invitation), harassment (because people feel like if it’s “different” it should get picked off), stigmatizing, and personal attacks. You really need to understand that if you put yourself out there, in a game, the cultural climate that it is in makes you “fair game” to a lot of the toxic gamer groups. Emotionally protecting yourself, and doing things like not listening to too much feedback, or comments, can help a lot. Before you make something like this, it’s a good idea to set up a positive environment for yourself where you can feel emotionally supported, or shielded. 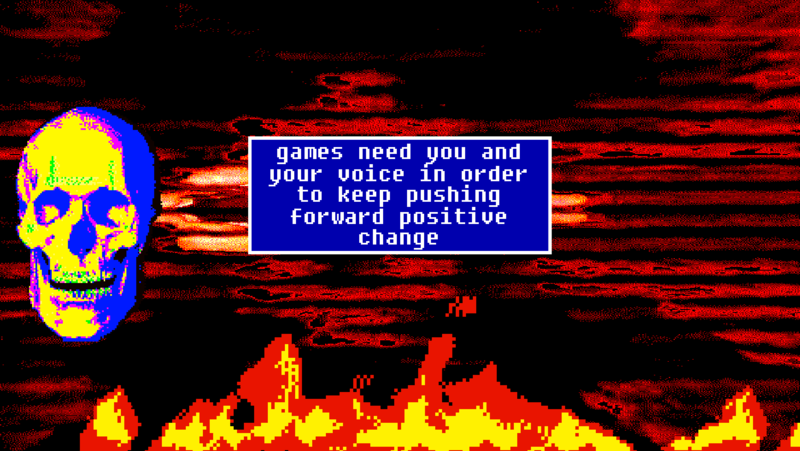 Like I mentioned, there are some things that you can do to disarm bullying toward alternative messages when designing your game. Things like aesthetic sends a message. I’ve found it important to visually set my own work apart by being outgoing about how different it is. Unusual visual styles can help a lot in disarming people, and encouraging them to be open minded. It can help to pace out personal messages so that people who are serious about engaging with it will find it, but toxic players who might be abusive will not be given access to it past superficial engagement. If you start pouring out your heart and soul from the get go, then people that want to hurt you will have easy access to that ammunition. If they have to work for it they are more likely to value what you have to say. I say access to ammunition because people that have read some of the personal things I shared in this work, have catered their attacks around that, and this can get difficult. It also helps to call it something else but a game. Gamers are very rigid in terms of what a game is, and what they expect from one. If you create something that is very different, and it ends up in the more commercial gamer circles, it can draw in hate because of how unlike a game it is. If you give it another definition, people like that will be less likely to come after you. None of this is easy in the event that it happens, but it helps to be aware of that so you can form design decisions around that. On the positive side, this sort of thing used to be a lot harder. I had an older project that was also very personal. It enjoyed quite a cult following. I stopped working on it in 2005, and the blowback to that one was much worst in terms of online harassment. I think the way that we have reacted to online hate movements, and pushed back against that with awareness of what harassment is, and educating people on how important diversity is, has made a difference in the long run. It was a lot harder to make stuff like this ten years ago. This sort of change is a slow process, but it is changing. At the end of the day it’s good to ask yourself if it’s really ok to give in to this type of opposition. Heartfelt messages from women, people of color, queer people… all belong in games, and the presence of these stories makes games more meaningful. This is work that we really need to promote so much more. This is why fighting for things like this are important. If you have the stomach for it, it should get done. 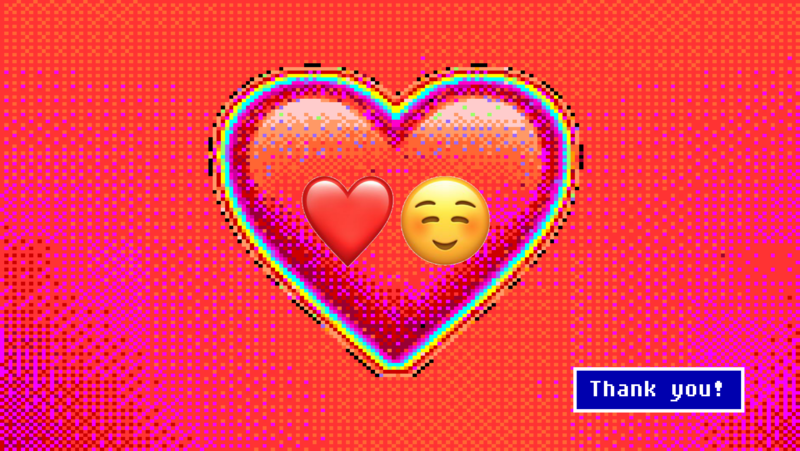 This work pushes the medium forward and normalizes alternative messages. I think that this is the point that we are at now. We need to normalize this type of work, and games really need these stories.